A seven-year drought has left Syrians hungrier and less secure. 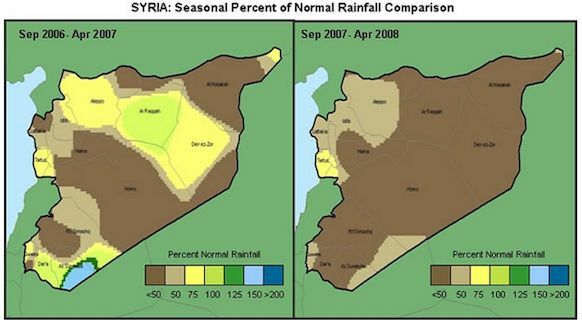 Among the factors that have driven the Syrian people to rise up against the Assad regime is a climate-change-related drought that caused a famine, according to ex-U.S. State Department advisor William Polk. Scientists warn that a specific drought cannot be causally linked to global climate change. It is more accurate to think of climate change as a “threat multiplier,” according to the editors of The Arab Spring and Climate Change from the Center for American Progress. Polk chronicles failures to respond by USAID and bad decisions by the Syrian government, but the threat multiplier was already at work. The Assad regime cracked down. Riots broke out. The government cracked down harder. By the spring of 2013, 100,000-plus had been killed, some 2 million had lost their homes, and 2 million more had fled abroad. “Vast amounts of infrastructure, virtually whole cities like Aleppo, have been destroyed,” Polk wrote. But the war seemed “stalemated.” Until the Assad government used chemical weapons. “Attribution of extreme events is a challenging science,” acknowledges the report Explaining Extreme Events of 2012 From a Climate Perspective, which details the results of nineteen analyses conducted by eighteen research groups from the American Meteorological Society. But “overall, these results agree with previous ones,” a study of drought on the Iberian Peninsula concluded, “and showed a tendency toward a drier Mediterranean for the period 1970-2010 in comparison with 1901-70, and that such a trend has been partially driven by the anthropogenic emissions of greenhouse gases and aerosols."